The USS General Pike was a sloop in service on Lake Ontario during the War of 1812. She was launched in the summer of 1813 from Sackets Harbor, New York. At the time, General Pike was the largest ship built on a Great Lake at 145 feet long. General Pike took part in a number of skirmishes on the Great Lakes as part of Commodore Isaac Chauncey's squadron, frequently serving as his flagship during her first year of service. After the war ended in early 1815, General Pike returned to Sackets Harbor and was sold in 1825. The USS General Pike was named after Zebulon Pike, a brigadier general in the War of 1812. Preceding the war, Pike led expeditions into the newly purchased Louisiana Territory, the first of which was the find the source of the Mississippi River. His second expedition, referred to as Pike Expedition, was to explore and map along the Arkansas and Red rivers. It was during this undertaking when Pike sighted and attempted to climb the mountain later known as Pikes Peak. On April 27, 1813, Pike was killed during battle while leading troops in the successful attack on Fort York which had been held by the British. Besides the aforementioned ship and mountain, Pike was the namesake of numerous towns and counties, as well as parks, dams, and a Liberty ship in World War II. 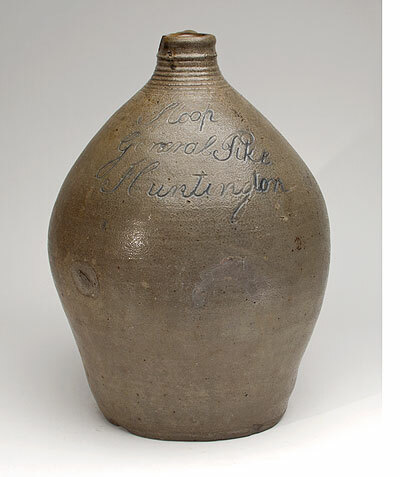 This jug was offered in our Premier Auction 128, September 21-30, 2015.